‘St Cuthbert’s Final Journey’ is an online fulcrum for Richard W Hardwick’s project as writer-in-residence at Durham University in 2013. Alongside a published book and an exhibition, the residency, funded by The Leverhulme Trust, aims to highlight a 9th century journey undertaken by the Community of St Cuthbert as they fled Lindisfarne from yet another Viking attack. The community gathered up their most precious belongings and, taking the advice of their hallowed saint, left their holy island for what was destined to be a seven-year journey that helped shape England and keep alight the flames of Christianity that were in imminent danger of being extinguished. Only seven men were allowed to touch the cart that carried their precious belongings on the momentous journey over the hills and dales of what is now Northern England and Southern Scotland. On the back of the cart was the coffin of St Cuthbert, his body inside, still preserved after his death almost two-hundred years earlier. Alongside him; the Lindisfarne Gospels, one of the most beautiful and important books in world history; the head of St Oswald, the king who brought Christianity to Northumbria, once the most violent kingdom in the land; and the bones of St Aidan, the missionary from Iona who converted Oswald’s people. They criss-crossed all over ancient Northumbria, a kingdom that had already been dissected by infighting and invasion. But this was not blind panic taking hold; far from it. By 875 AD, when the Community of St Cuthbert left their vulnerable island home, the Vikings had taken control of much of the landmass right up to York and had permanent military outposts along the Tyne River. This journey was vital in maintaining belief in a victorious future, and the Church of St Cuthbert had great power in Northumbria. St Cuthbert had performed miracles around these hills when he was alive and they brought his body, almost two hundred years later and completely undecayed, a miracle in itself. They made strategic decisions, heading towards and right into enemy territory. In Crayke, near York, they staged a bloodless coup; saving the young Dane Guthred from slavery and helping him depose the current Viking leader. This paved the way for negotiations with King Alfred, who was using guerrilla warfare tactics down South and would eventually become known as the first king of the English nation. Eventually, after seven exhausting years, they settled at Chester-le-Street with Guthred’s blessing and were given Wearmouth and Jarrow as properties, where Bede had written the previous century. 113 years later, the Community of St Cuthbert moved to nearby Durham, where St Cuthbert’s body still lies in the great Norman Cathedral. Richard W Hardwick, Durham University’s writer- in-residence, is researching the route and the history around it. And then he’s taking award winning photographer Paul Alexander Knox with him, as they travel the whole route in April 2013. Together, they will record the landscape, describing it today and imagining how it would have been for the monks in the ninth century. They will visit the forty-seven places the community of St Cuthbert took refuge in and, aided by students from Durham University, Richard will write a history of each place from the time of the original journey until the current day. Students, who come to Durham University from all over the world, will be asked to participate by researching one or a number of the places the community stopped at. By participating in this project they will begin to understand and appreciate the culture, industry, history and people of the North of England. The photography and writing will be exhibited at The Festival of the North East and also as part of Durham’s Lindisfarne Gospels Exhibition, which celebrates the return of the Lindisfarne Gospels to Durham, from July 2013 to September 2013. 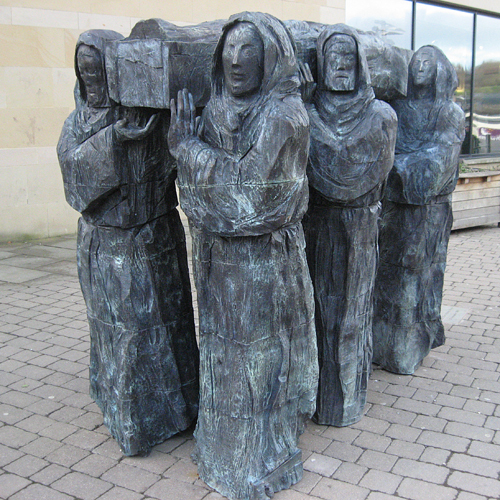 ‘Retraced: St Cuthbert’s Final Journey’ will be a free exhibition from 28th June to 3rd August in Millennium Square, Durham, next door to the Gala Theatre and appropriately, across from Fenwick Lawson’s sculpture ‘The Journey’. Additionally, the writing and photography will be published in a beautiful hardback book, with the aim of turning the route into a national trail that people can walk, cycle and drive. And then, in 2014, the plan is to take the books and photography back around the route for a touring exhibition that will unite the communities that once gave shelter during the ninth century – and help them realise and celebrate what a pivotal role they played in a vital part of England’s history. wonderful project! I have linked to this site on my HALIWERFOLC blog and will shortly make a post about this. Please visit http://saintcuthbert.net for news and information about all things Saint Cuthbert! Thank you Donna. And actually, I have your blog in my favourites already and I’m wondering why the heck I haven’t sent you a message first. Your blog is great! I will visit again very shortly. As for links, I will have to sort those out too. thanks! Post is now up. What a great project to learn about with interesting history and a wonderful sculpture. I’m very much looking forward to following your travels, Richard and Paul, and hopefully walk some of the trail myself. An excellent project! Thank you. And I am enjoying your own blog very much – well written and a great deal I can learn from, thanks. I stumbled upon your exhibition the other day and am now working my way through your journey here, really interesting reading, thank you! Very impressive sculpture/carving. Took my breath away.